The BioTek Multiflo Microplate Dispenser provides you with a microprocessor controlled syringe reagent dispenser that’s fully modular and upgradable. This reagent dispenser features 1 peristaltic pump and a wide volume range between 1µL to 3mL, and supports microplates from 6-1536 wells in a broad range of formats such as standard, low profile, deep well plates, PCR trays and microtubes. This digitally controlled microplate dispenser distributes at a 7° angle, minimizing disturbance to loosely-adherent cell monolayers, and in as little as 7 seconds for a 1536 well plate. This BioTek Multiflo plate dispenser can be used alone though the user-friendly key pad and 24-character 2-line LCD screen, or can be controlled through a PC with LHC software for added flexibility and precision. The Multiflo is also BioStack compatible for complete automation. All dispense paths are autoclavable so you can be sure of a sterile environment. 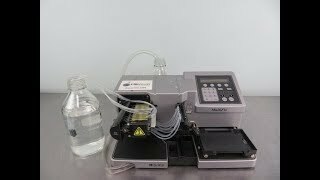 The BioTek Multiflo Microplate Dispenser also features programmable shaking and soak functions, and preprogrammed maintenance routines. 10µL/well, 96 wells, 8-tip cassette: 3 sec. 5µL/well, 384 wells, 8-tip cassette: 7 sec. 1µL/well, 1536 wells, 8-tip cassette: 21 sec. Please note, cassette is not included. The one viewed in the images is our test cassette we purchased new to QC the instrument. This BioTek Multiflo Microplate Dispenser has been fully inspected and is performing to expectations. Please note, cassette is not included. The one viewed in the images is our test cassette we purchased new to QC the instrument. All of our lab equipment comes backed with our standard warranty. Should you have any questions, please don't hesitate to contact us.